Are you looking for a closer relationship with God? Are you looking for a church family? If so, we'd love for you to visit our family here at Pleasant Plains. We do not claim to be a perfect people by any means, but we do claim to have and follow God's perfect standard as our guide in this life. We'd be honored by your presence any time you have the opportunity! We gather for Bible study and worship on Sundays at 9:30am, 10:30am, and 5:00pm. 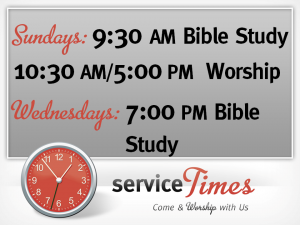 We also have a midweek Bible study on Wednesdays at 7:00pm. PlayHow Does God Use Us?